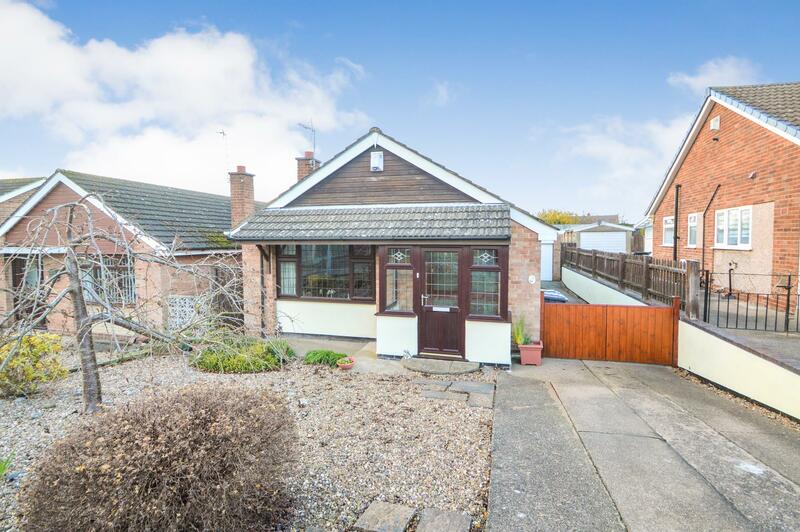 Benjamins are delighted to bring to the market this extended two bedroom detached bungalow. The property is situated in the much sought after residential village of Keyworth on Rowan Drive, offering local amenities including shops, schools, medical centre, sports facilities and public transport. The property benefits from newly fitted kitchen and bathroom, solid wood internal doors and large reception space and briefly comprises: Porch, entrance hall, refitted kitchen, living room, 26ft dining room, conservatory, refitted bathroom, two double bedrooms, garage with off street parking and a generous enclosed garden to the rear. Internal viewing of this bungalow is highly recommended to appreciate the accommodation on offer. UPVC double glazed door into entrance porch with windows to the side and front aspects, tiled flooring and light, door into hallway. Door into hallway, space for coats and shoes, wall mounted heater and archway into the kitchen area and door into front living room. UPVC double glazed window to the front aspect, ceiling light fitting & wall lights, gas fire with surround, carpet & door with access to the rear reception rooms, door to inner hallway. New kitchen installed in November 2017 with a range of cream wall and base units with worktops over, stainless steel sink with drainer and swan neck mixer tap, green & cream tiled splash backs, electric hob with extractor fan over, single integrated electric oven & microwave oven, space for dishwasher and washing machine, ceiling light fitting, UPVC double glazed window & door to the side aspect onto driveway. Large open dining space with UPVC double glazed window to the side aspect, ceiling light fitting, carpet, radiator, storage cupboard, open doorway to the rear sitting room. With UPVC double glazed window to the side aspect, ceiling light fitting & wall lights, radiator, carpet & sliding patio door into the conservatory. With radiator, carpet, window into bedroom one and door into the garden. UPVC double glazed window over looking the rear garden and small window into the conservatory, fitted wardrobes, ceiling light fitting, radiator and carpet. UPVC double glazed window to the side aspect, ceiling light fitting, radiator and carpet. Newly installed bathroom suite in June 2018, includes panelled bath with shower over, wash hand basin with vanity unit below with modern mixer tap, low level WC, tiled walls with decorative border, towel rail radiator and a double glazed frosted window to the side aspect. The front has a long drive down the right hand side of the property with gated access down both sides of the property. There is a single garage with up and over door. The rear of the property has a paved patio area with a path to the bottom of the garden, lawn, fenced borders with mature shrubs and door with access into the garage. With up and over door to the front, window and door to the side aspect which gives access to the garden. The local authority Rushcliffe Borough Council has advised us that the property is in council tax band C which we are advised, currently incurs a charge of £1682.88 (2018/19) Prospective purchasers are advised to confirm this.